Walter Bowman is looking forward to spending the holidays inside in his new Mansfield residence. Bowman has had to sleep in a car or on friends' couches in recent years. Walter Bowman is no longer homeless; he has his own place for the first time this Christmas. MANSFIELD - Walter Bowman has been living on the streets on and off for the past 15 years. 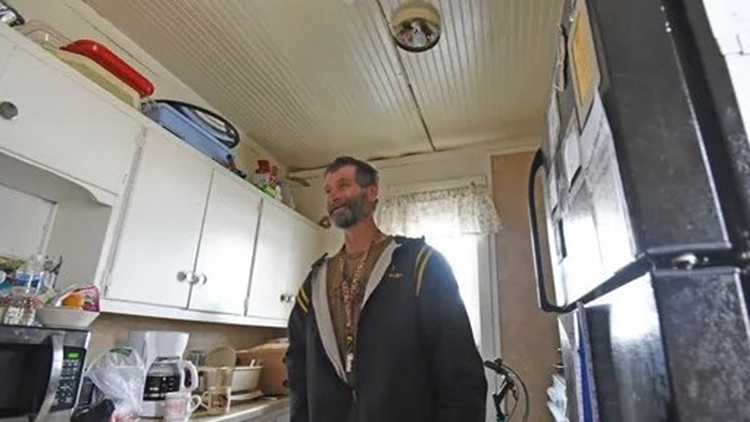 This Christmas he has his own place, thanks to the help of Angie Henke of Reaching Out Ministries who helped Bowman, 49, fill out paperwork at various agencies and obtain ID. Her husband Marc fixed his stove and Walter now has cable TV. Bowman, who is simply known as "Walter" by almost everyone downtown, mows lawns. He has about a dozen residential customers during the summer and fall months and he also picks up aluminium cans to make extra money. He pushes his mower to his jobs, some are quite a distance for him to walk to and from. "I think I need a riding mower," Walter said with a laugh. Inside his upstairs, tidy efficiency apartment in Mansfield, Walter showed visitors around. He had just walked home from the weekly food pantry distribution offered Thursdays at Grace Episcopal Church on Third and Bowman streets. He was very excited about the cardboard box of food. "I'm going to cook," said Walter, pointing to the fresh bread. "I don't know what yet." He now has a microwave and stove and he just bought some pans and made spaghetti the night before. Walter Bowman is working on sharpening his cooking skills in his new kitchen. Previously, Walter's meals were all eaten at various area churches that offer free meals or "soup kitchens" as he called them. "I don't know what to think sometimes; it's too much," he said of living on his own since October. In the recent past, Walter had been living on Sixth Street, he said, sometimes in a vehicle or a shed or sleeping on someone's couch. For a while, he lived with siblings. The talkative Walter also has a 6-year-old daughter who he would like to see. He also has grown children from another relationship who he talks to occasionally. Walter came to Mansfield from Pennsylvania to attend the Madison Schools when he was in the sixth grade. He said he did not graduate but tried to work many jobs, including a job at the Mansfield Cemetery in recent years. He doesn't drive. enke oversees his finances as he has always faced some life challenges because of his developmental disabilities. His new apartment living room doubles as his bedroom; he sleeps on a futon. A new Christmas tree is decorated with ornaments and gifts that some people made him at a church. Walter said he likes riding his bicycle and reading the newspaper, the latter which he does daily at the Mansfield-Richland County Public Library. And if he can't find the paper because people don't put it back where it belongs at the library, he said he goes and buys his own News Journal. He collects coffee cups and showcases them neatly on a couple shelves in the kitchen. He prefers people not touch them, he said. Walter said he doesn't really want anything for Christmas, saying that he has everything he needs. He is very generous and likes helping people, carrying food boxes for blocks to people in need who have no way to get to the food distribution site themselves that day. "I don't think I could get anything else in here," he said. "I guess I could use more clothes. I just wash the same old ones." Walter washes his clothes at Reaching Out warming center on Harker Street. He also is glad to lend a hand there when needed. Angie Henke said she first met Walter on Ashland Road when Reaching Out Ministries had a free store. "He brought his daughter and said she wanted to shop," Henke recalled. "Walter is a really good, good guy. He comes to our house. I met him a little over three years ago and I'm just trying to look out for him," she said. Walter told visitors he furnished his own apartment with some items thrown out by others. He showed a visitor a name tag he was given, which he placed on his door. It reads simply, "Walter." "I like it here," he said, telling visitors to stick around because he was going to cook.